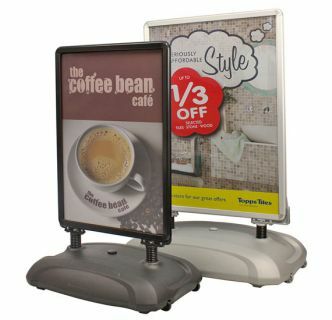 Sightmaster Pavement Sign, the ideal choice for street side point of sale and advertising for businesses. Designed for durable outdoor use, providing an affordable and professional looking pavement display. 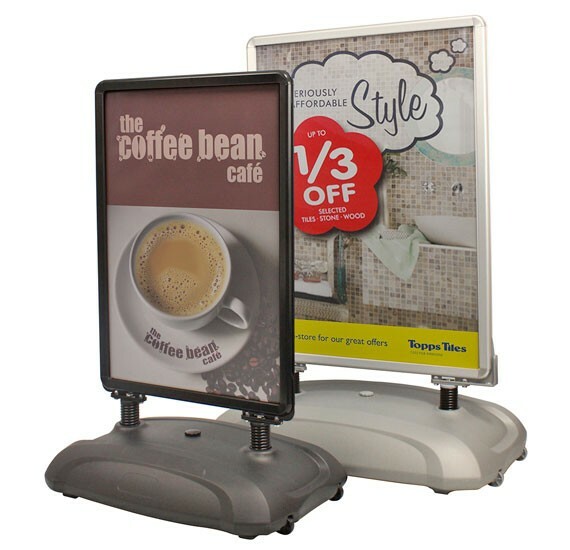 Supplied with an aluminium snap frame and a unique water filled base, delivering cost effective outdoor point of sale advertising with easily interchangeable graphics. Is the Sightmaster Pavement Sign supplied with printed graphics? Yes, we would supply the Sightmaster with your artwork, high quality digitally printed to your specification. Can I change the graphics in the Sightmaster? Yes, the Sightmaster is designed to allow you to easily replace the graphics allowing you to get the most out of the sign. Can you print replacement graphics for the Sightmaster? Yes, if you already have already purchased a Sightmaster Pavement Sign from us in the past we can help you with replacement graphics for your sign. Note if you have a Sightmaster that was purchased from someone else, please check sizing as it may differ slightly from the ones we stock.